When the owners of a golf course needed to remodel their clubhouse in time for a huge golf tournament, they looked around for suppliers who could help them accomplish the task. 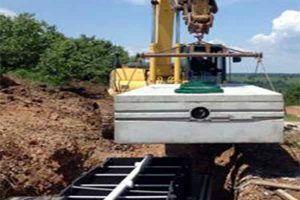 When it came to their need for an on-site wastewater treatment system, they turned to SI Precast Concrete Products for their experience and efficiency in providing commercial wastewater treatment systems. From the start, the project faced numerous challenges. The site was rocky and difficult to work. The placement of the treatment system would require clearing an existing retaining wall. This meant that the concrete tanks – which weighed almost 15 tons each, had to be lifted over an existing retaining wall and placed into position. Most importantly, the project was under a tight deadline due to the upcoming golf tournament. SI Precast Concrete was chosen because of our proven quick turnaround time. We can configure wastewater tank castings to form 3,000 gallon, 4,500 gallon and 6,000 gallon wastewater tanks with either single or dual compartments. The tanks are then plumbed in a series to create unlimited capacities and flows. The modular wastewater treatment system installed at the golf course consisted of three 4,500 gallon tanks for trash, treatment and pumping, along with a 3,000 gallon-per-day treatment unit. Duplex pumps, controls and drip equipment for 15,000 square feet of drip field completed the onsite wastewater treatment system. SI Precast has the capacity to pour one of each casting per day. And, at any given time, we typically have several castings in stock. Therefore, we are able to meet the demands of a project such as this one. The on-site wastewater treatment system was produced and installed within the given time frame of four weeks. As a bonus, the golf tournament was a huge success! SI Precast offers a wide range of wastewater treatment products for both commercial and residential applications and can assist you in finding the right solution for your specific situation. Contact us today to learn more!